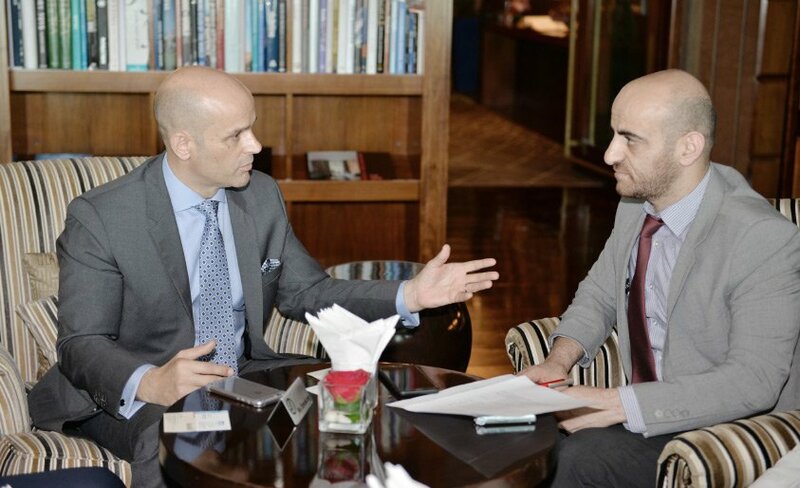 Le Beck International (Le Beck), a specialist security and risk management consultancy in Bahrain, says security of mega city and infrastructure projects is critical to their attractiveness and to providing ‘peace of mind’. He says there is a huge reputational risk that should also be considered and if people and organisations do not get the feeling the environment is safe and secure, they will consider alternatives in an ever-increasing list of choices and options that they have. “Demonstrating from the outset that security is a major consideration and communicating the same, is critical to the attractiveness of the project and to providing peace of mind,” he adds. Oman: What is Le Beck International? We are an independent specialist security and risk management consultancy with a dedicated presence in the MENA region for over 15 years. Our mandate is to empower and prepare senior executives with the ability to identify and mitigate security risks, threats and vulnerabilities in order to protect their most critical assets- their people, their business and their brand reputation. We take on an advisory role and security products, systems and services that we recommend and sourced through third parties (locally, regionally or internationally) thereby avoiding any conflicts of interests. Why did you decide to set up base in the Middle East? I started the company in 2001 and we came to the Middle East in 2004 following the compound bombings in Riyadh, Saudi Arabia. It was a real paradox for Saudi, which was one of the most secure and crime free countries in the world, until 2004. Suddenly there were threats to business and reputation of the country. I made a CEO decision to move everything we had to Riyadh, because I saw an opportunity in the fact that the Middle East was never going to be the same again. BILD: What are the exact reasons behind the blockade of Qatar by four ME countries? “Only” the financial support of ISIS and Al-Qaeda or also a political affiliation with Iran? Same complex: What are the practical demands by the four states to Qatar? EPS: The stated reasons are Qatar’s alleged interference in domestic affairs and support for terrorism, a list of which interestingly includes both Shiite (aka Iranian-backed) and Sunni groups. It’s important to mention that this is a notable escalation/expansion from what started these tensions, i.e. controversial statements attributed to Qatar’s Emir regarding Iran, Israel, and the US but which Doha stated was actually the result of a hack. The aim of these moves is likely to pressure Qatar, both politically and economically, into changing its policies, especially vis-a-vis Iran and Sunni groups like the Muslim Brotherhood. BILD: Is there a connection between the recent Trump speech in the KSA – on terror financing – and the measures taken now? EPS: No, I don’t think there’s a direct link, even if one of the alleged statements by Qatar’s Emir related to “tensions” with the US administration. This should be primarily seen as related to intra-GCC disagreements. BILD: How will the blockade affect Qatar, talking about security of supply, tourism and (air) traffic? EPS: In practical terms, Qatar will suffer economically from these measures. The closure of the four countries’ airspace to Qatar, for example, means that its national airline will need to reroute its flights travelling west and northwest, such as to Europe and North Africa. The shuttering of the border with Saudi Arabia means that any overland shipping will cease, while the closure of territorial waters means that shipping routes will need to be altered. Tourism will also likely take a hit. EPS: Qatar was, indeed, ejected from the Saudi-led intervention in Yemen. When it comes to its participation within the US-led coalition, I don’t think this will alter the status quo and statements from the US indicate it will be business as usual. Secretary of State Rex Tillerson specifically stated that it won’t have “any significant impact, if any impact at all” on the fight against terrorism regionally or globally. The US Ambassador to Qatar also tweeted statements expressing US support and appreciation for Qatar’s fight against terrorist financing. In addition to its interest in maintaining membership in the coalition, the US a key military presence in the country, with CENTCOM’s forward headquarters based there. BILD: “Was this it?” Or is there a change escalation in diplomatic measures, maybe even resulting in military conflict? EPS: I think the risk for military conflict is low and this is because a unified (emphasis on unified) GCC is still considered an important counter-balance to Iran in the region. It’s not in anyone’s interest to see this devolve into a military conflict. BILD: How long do you think, the four states will maintain the taken measures. Is it a short / medium or long-term strategy? EPS: If the strategy is to strong arm Qatar into changing its policies, then the ultimate goal is a mediated solution that sees a shift in these policies. Although this rift far exceeds that of 2014, we can look to events of that year for guidance. The four countries involved here withdrew their ambassadors then for similar reasons, but predominantly Qatari support for the Muslim Brotherhood. Ultimately, relations resumed after mediation, including by Kuwait, and I think we might see a similar situation here. BILD: What would Qatar have to do so the “blockade” measures removed? And do you think it will it fold to the demands? EPS: If 2014 is any indication, a negotiated settlement can likely be reached. While Qatar will need to weigh the pros of resuming relations as usual with the cons of being seen as giving in to demands, the other states will also need to consider the ramifications of long-term disunity within the GCC and the potential of pushing Doha too far into the arms of other parties (i.e. Iran). BILD: Last but not least: The FIFA world cup will be in Qatar in 2022. Do you think the international planning will continue if the country is accused of collaborating with designated terror organisations? EPS: I don’t know a lot about soccer, but I think there’s a lot of time between now and 2022 to resolve this. It’s also worthwhile to mention that Qatar has weathered other controversies related to the World Cup, including issues related to conditions of foreign workers and bribery allegations. It is not often that one gets to talk one-on-one with a Bomb Disposal Officer with extensive operational experience in hot spots all over the world. 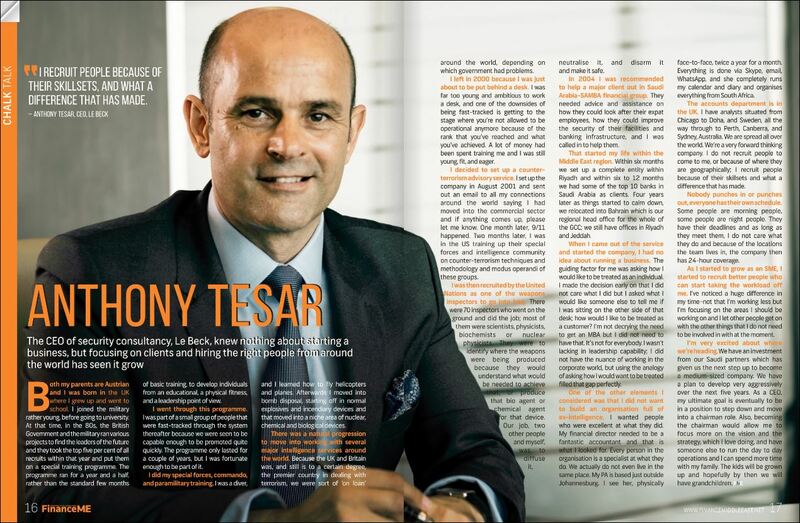 And yet here we are, sitting over a cup of coffee, talking to Anthony Tesar, Founder and CEO of Le Beck, a leading security and risk management consultancy based in Bahrain. Even more intimidating, Anthony is an expert in the use, deployment and mitigation of chemical, biological and radiological weapons and terrorist devices and has worked extensively in crisis zones across the world from South America, Middle East, Africa through to Asia. In short, his profile reads like a Counter Terrorism organisation’s wish list for a go-to specialist. And that precisely is what Anthony Tesar is. 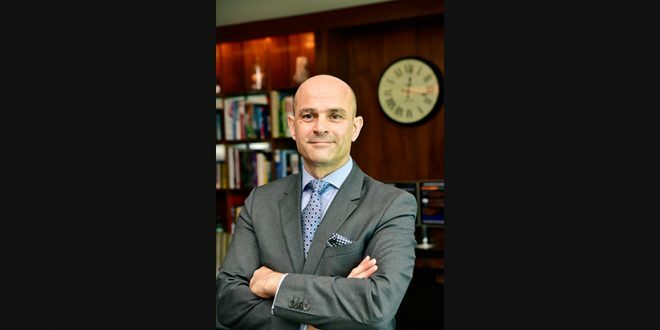 A British security expert said he advised of a number of companies operating in Bahrain during the events of 2011 not to leave the country, and he managed to discourage them from making this decision.